One of the guiding principles of teratogenics is the all-or-nothing theory. Scientifically, it goes something like this: "embryonic exposure that occurs before organogenesis results in either no adverse embryonic outcome or in embryonic death." In layperson's terms that means that if a mother ingests, inhales, injects or absorbs anything toxic to the fetus in the earliest weeks of pregnancy, the outcome, it will either be fine, or the pregnancy will not continue. This period of pregnancy is brief, but it's not that brief—estimated around 4-5 weeks from conception. That's long enough that a woman with a regular cycle would notice a missing period before putting any potential developing embryo at risk. But that would require her to pay attention to her body, and that's not really how things work around here. A woman's body is a mysterious and disgusting thing. Self-awareness is beyond reasonable expectation. Public health recommendations aren't about asking people to think for themselves. They're about the lowest common denominator, and the assumption that people will make the stupidest possible choices. 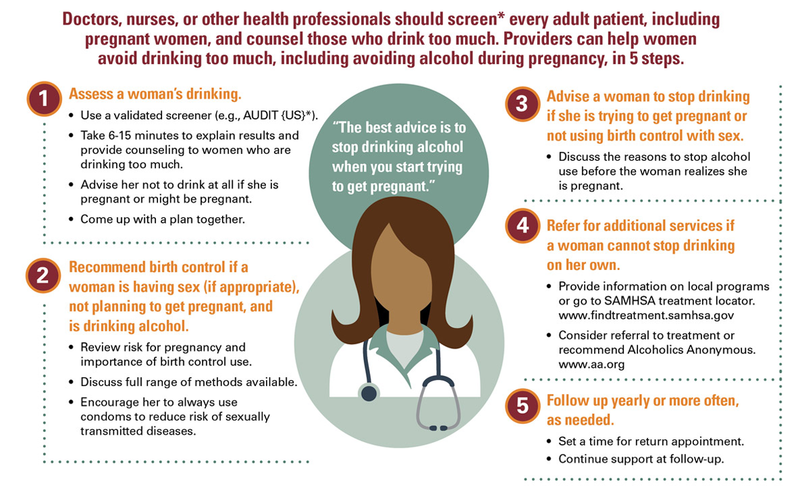 So instead, the CDC just advised all women of childbearing age to avoid alcohol altogether if they're sexually active, unless they're using birth control. It's not clear what birth control means here. But the graphics released with the new recommendations refer to condoms separately (for STD protection). The implication is that it's women's job to protect the next generation, whether they're planning to contribute to it or not. It's an insurance policy for the unconceived. And women are paying the premium. 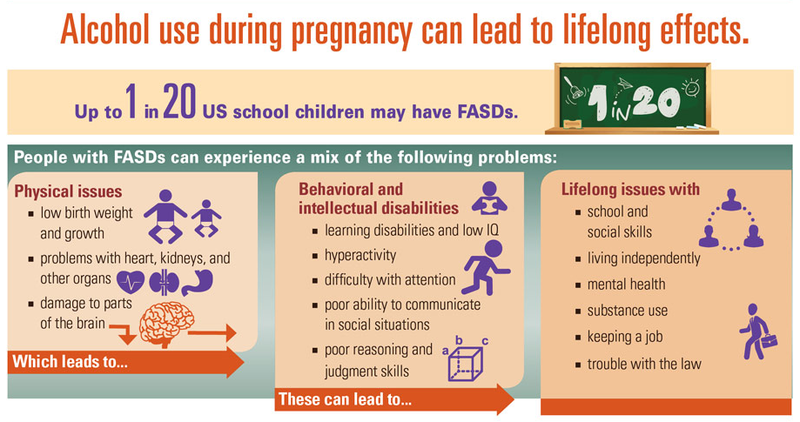 Fetal Alcohol Spectrum Disorders are devastating. And they are, as the CDC reminds us, 100% preventable. Advising women not to drink is a win from a public health perspective. Alcohol can contribute to a lot of bad things. We already know it can get you raped. It even get you pregnant, or give you an STD, according to the CDC. Temperance may seem like a small price to pay. The CDC doesn't care that alcohol equals freedom in the language of American media and marketing. They care about one thing. Well, maybe two things. But the assumptions made here have deep and disturbing implications for women. What does it mean to advise a 21 year old woman to consider the welfare of a pregnancy that doesn't exist? It means she never gets to feel like an independent person making responsible choices for herself. It effectively erases the sliver of a woman's adult life in which she is able to consider herself separately from her relationship to childbearing. What does it mean to release these recommendations in the shadow of the first U.S. cases of the Zika virus, which is even more devastating to a developing pregnancy than alcohol? In the shadow of the GOP front-runner's promise to outlaw all abortions in America? If personhood was not a looming possibility, would we be hearing this? If access to abortions wasn't dwindling and birth control coverage was not a question? This is the CDC acting in its singleminded interests. But's it's also the CDC shoring up for an inevitable increase in unexpected and unwanted pregnancies, responding to the realities of right-wing policy. This is a whiff of how restricting women's reproductive rights can and will affect the autonomy of women, whether they're pregnant or not. It's not hard to imagine a world where the lifelong effects of alcohol use during pregnancy extend to 'trouble with the law' for a mother, whether or not it affects her baby. Thank you for helping me make sense of this recent announcement from the CDC. I found the last paragraph particularly insightful and compelling. It’s chilling really, and menacing in regards to the specter of increasingly invasive and moralistic legal liabilities. We can’t look away for a second!